(Formerly titled: Never Be Boring Again) Learn how to make entertaining and effective presentations with the Story Theater Method. This book is unlike any other book on speaking skills. It teaches a breakthrough method that can help you make dynamic business presentations in front of any audience, anytime, anywhere. This comprehensive and practical exploration of storytelling in business will help you to be a better speaker immediately. This 6 audio CD set covers how and why stories work, how to choose, place and develop your stories to make your business and training points; how to craft and structure stories for greater effectiveness; how to add humor and drama to your stories; and how to perform stories. 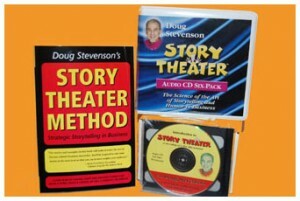 This 2 CD set provides a great overview of the Story Theater Method and an update to the Story Theater Audio Six Pack. It covers the four types of language, intuitive intelligence, and Doug’s latest philosophies on “emotion is the fast lane to the brain” and The Law of 50 Impressions.